Children of deployed parents work together in teams to overcome obstacles during a leadership challenge course led by Soldiers from U.S. Army North at Operation Purple, hosted by Blue Streak Stables Horsemanship Camps. Photo by Staff Sgt. Keith Anderson, Army North PAO. Photo courtesy of U.S. Army. Thanks to the National Military Family Association (NMFA), military kids aged 7 to 17 can attend a free week-long summer camp through the NMFA's Operation Purple Camp program. Applications are generally accepted in February and March. For the specific dates, visit Operation Purple's FAQ page. There are a total of 29 weeks of camp at 24 locations (several locations have multiple weeks) around the US. The selection process is done on an individual basis, not a first come, first served. You'll be notified about six weeks after applications close. To ensure that as many kids get to experience Operation Purple camps, your children will be able to attend only one camp per summer. The camp itself is free. However, transportation is not covered, so NMFA recommends that you apply to the camp nearest to you. In addition, you'll have to send in a "hold my spot" refundable deposit of $25 per child ($50 max per family). You'll get your check back as soon as your child checks in at the camp. Because space is limited and so many children want to attend camp, if it turns out that your child has to cancel, you'll need to give the specific site at least three weeks advance notice. If you don't give notice or your child is a no-show, you'll lose your deposit, plus, your child will be barred from ever attending an Operation Purple camp in the future. Who Goes to Operation Purple Camps? Children of active duty, Reserve, and Guard servicemembers from any branch of the U.S. Armed Forces are welcome to apply. According to the NMFA, 43% of children who attend Operation Purple camps have a parent who is wounded, ill, or injured. Forty-seven percent of campers have had at least one parent deploy in the previous 15 months. Children who've attended an Operation Purple camp in the past are eligible to attend again, but priority is always given to kids who've never been or who have a deployed or injured parent. Outdoor activities, ropes courses, climbing walls, and other adventure are just a small part of what campers experience. 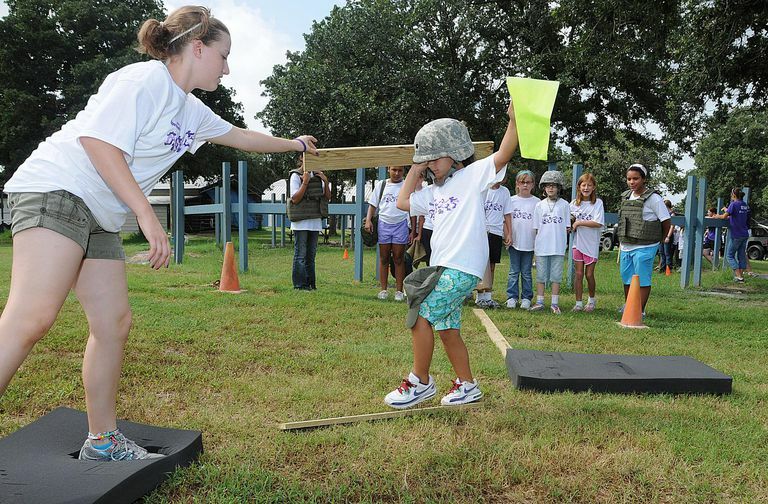 Through Operation Purple, military kids will learn leadership and coping skills to help them deal with the unique issues military families face. Each camp has its own unique programming. You'll find detailed information, including location, contact info, session dates, and the ages of campers accepted on the NMFA's program page. Wanting to give military kids an escape from the stress of wars and deployment, Operation Purple was formed in 2004. Since then, more than 30,000 military kids have attended the summer camps.